Recently a friend of mine asked me, “Do you know what is the best mattress for back pain?” She was having a hard time falling asleep and staying asleep because of sciatica and some back problems. I figured the firmest mattress (hard mattress) was probably the best but I really didn't know for sure. To answer her question, I decided to dig into the medical literature to see what was in there about the best mattress for back pain. I went back about 10 years. There aren't a lot of studies on mattresses and back pain. But there's enough information there to make a really good decision. And not only was I wrong about what I thought was the best mattress for back pain, but so are a heck of a lot of doctors who deal with back pain. Firmer does not mean better for back pain. In 2003, a study from Spain of 313 adults with chronic low back pain examined the effect of mattresses on their levels of pain while lying in bed...and when getting out of bed. Some of these people got new firm mattresses to sleep on for 90 days and some got new medium-firm mattresses. None of the participants knew which type of mattress they had received. The study states: A mattress of medium firmness improves pain and disability among patients with chronic non-specific low-back pain. A medium-firm mattress provides good support while distributing pressure points on the body when lying in bed. However, a mattress that is too soft is just as bad for low back pain as a mattress that is too firm. In a 2005 study, The Journal of the Canadian Chiropractic Association pointed out that in a survey, 76% of orthopedic surgeons recommended firm mattresses. And most health professionals recommend hard or extra firm mattresses. The problem again is that these types of mattresses decrease the ability of the body to have more contact with the mattress. That means more pressure on the parts of the body that do touch the mattress. This in turn means more pain in bed and getting out of bed. It's a known fact that low back pain significantly affects sleep quality. A study in 2006 (Journal of Chiropractic Medicine) also looked at sleep quality in relation to medium-firm mattresses. The study of 30 women and 29 men showed this: For 28 days, subjects slept in their owns beds. Then they slept in beds with new medium-firm mattresses for 28 days. With this new bedding, there was significant improvement for back pain and stiffness, comfort, and sleep quality. Is it starting to become clear here what the best mattress for back pain is? A 2008 study in Applied Ergonomics showed that age of and quality of bedding had a major effect on back pain. People sleeping in new beds had significantly less pain and more comfort than when they were sleeping on their older mattresses. The average age of the beds people were sleeping on before getting the new mattresses was 9.5 years. In addition, the study states: It was found that for the cheapest category of beds, lower back pain was significantly more prominent than for the medium and higher priced beds. Isn't that just how life is? So let's wrap up this article on the best mattress for back pain with two final studies I uncovered. Below, we'll also take a look at three top choices for where to get the mattress of your dreams. The first study was in Spine. One hundred and sixty people were divided into three groups for a one month test of new mattresses. People in group one were given water beds...group two memory foam mattresses...and group three hard mattresses. People who slept on the water beds and memory foam mattresses had improved back pain symptoms, back function, and sleep quality. Both mattress types were deemed superior to a hard mattress. However, there were no differences observed between the water bed and the memory foam. Now I don't know about you, but I've slept in a few water beds over the years but never really liked them. I always felt like I was sleeping in a row boat. So what about memory foam mattresses? 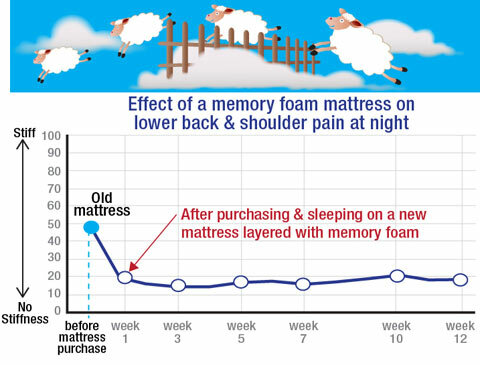 A 2010 study showed that replacing patients' beds with new medium-firm mattresses, layered with memory foam and latex, provided significant improvement in both back and shoulder pain. Check out this chart below and you'll see what the best mattress for back pain is. As you can see, there is over a 60% drop in back pain and stiffness, resulting in improvement in sleep quality after just one week! And these results continue through week 12. Researchers also mentioned there was a significant drop in the number of days per week that people were experiencing poor sleep and physical discomfort. Searching around to find a quality mattress is like getting your teeth drilled at the dentist without novocaine. Yes, it's that painful! So I'm going to save you all that trouble. I've searched for hours all over the Internet to bring you three excellent choices of mattress companies. Company one, Saatva Inc, sells America's luxury mattresses for a steep discount. Their prices are unbeatable. And if you don't live in the United States, no problem. Saatva ships their discounted luxury mattresses where you live. After you pick out the items you want on Saatva's website, select International Checkout as your shipping option. They are experts at shipping anywhere in the world. Saatva offers an in-home trial of their mattresses for 120 days. No hassles. No risks. Because they want you to test out your mattress and be happy with it. Now isn't that better than buying a mattress after spending 20 minutes lying down on it in a mattress store? Think about it. Would you marry someone after knowing them for 20 minutes? You're going to have your Saatva for 15 years. Spend 120 days to get to know it! That's why this may be the best mattress company on the Internet. Click here to go to Saatva. See why people like these mattresses so much. Company two, Essentia, is recommended and was featured on Dr. Oz's TV show and Anderson Cooper's TV show. They claim to have the world's only truly natural memory foam mattresses. I must say, these are incredibly pure memory foam mattresses. However, they are expensive. So unless you have a lot of money, I think you can get a much better deal with the third choice below. Watch out Tempur-Pedic! There’s a new memory foam mattress company in town. Loom & Leaf has flipped the world of buying memory foam mattresses upside down. Now you can get a luxury queen from Loom & Leaf for only $999. A similar mattress at Tempur-Pedic would cost you $3,699. Loom & Leaf mattresses are built in America with American high-grade, non-toxic memory foam. Certified pure by Certi-PUR. They also use a unique medical grade cooling gel. It’s placed in the spinal zone area to keep you cool and comfortable with no pressure points. When you buy one of these mattresses, you’re not only sleeping well at night…you’re helping to keep the American economy strong. Loom & Leaf has a 120-day in-home trial for their mattresses too. 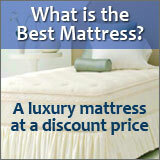 Click here to check out your new luxury memory foam mattress. You may just find that for you, this is the best mattress for back pain. Thousands across the nation are using these mattresses as a sure-fire way to sleep better. Here are their experiences in their own words. Click here for Saatva reviews. Click Here for Loom & Leaf reviews. Click here to download your FREE special report created by Sleep Passport on How to Buy a Mattress. This 9-page checklist contains the important questions for you to ask—and know the answers to—before buying a mattress. Effect of firmness of mattress on chronic non-specific low-back pain: randomised, double-blind, controlled, multicentre trial. Lancet. 2003 Nov 15;362(9396):1599-604. Biomechanical effects of a lumbar support in a mattress. The Journal of the Canadian Chiropractic Association. 2005 Jun;49(2):96-101. Subjective rating of perceived back pain, stiffness and sleep quality following introduction of medium-firm bedding systems. J Chiropr Med. 2006 Winter;5(4):128-34. Grouped comparisons of sleep quality for new and personal bedding systems. Appl Ergon. 2008 Mar;39(2):247-54. Epub 2007 Jun 26. Better backs by better beds? Spine (Phila Pa 1976). 2008 Apr 1;33(7):703-8. Effect of prescribed sleep surfaces on back pain and sleep quality in patients diagnosed with low back and shoulder pain. Appl Ergon. 2010 Dec;42(1):91-7. Epub 2010 Jun 26. Consumer reports: Mattresses. May 2010. Links to Saatva and Loom & Leaf are compensated affiliate links because when you buy from them, you are going to love your mattress. They make it easy! To learn more about Saatva, and why their mattresses are so comfortable, simply click the image below.